Markus Hengstschläger spoke in a DIALOGUE with Rainer Nowak, the editor-in-chief of the daily newspaper Die Presse, about politics as an event, career changers, media and false news. “Which reforms will the new Austrian government tackle first?” Markus Hengstschläger wanted to know right at the beginning of the conversation.” You can not say that exactly. But a government should start with the unpopular and necessary measures at the beginning of its period in order to create room to maneuver for later. Therefore, one will probably first try to curb the expenditure in the federal government”, said Nowak. Personally, he expressed his enthusiasm for a federalism reform based on the Swiss model: more skills, but also more responsibility for the federal states – and more direct democracy. 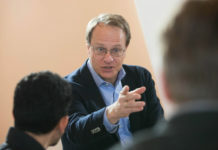 “But that will hardly be feasible”, the editor-in-chief expressed skepticism, but just as little believed in the realizability of “more centralism”. When asked what he thinks of political cross-entrants, came a clear answer: “Newcomers rarely work well. It is often overlooked that politics is simply a craft to learn.” On the other hand, there are always positive examples: “People who just have the right flair for politics are also successful in this profession”, said Nowak. The role of the media in the democratic process is undeniably central. A new trend, however, is that conscious media consumption is declining: “More and more people are waiting for news to reach them in their Facebook stream, they are not reading newspapers or watching news. They then assume that they are relevant news, if they penetrate to them”, said Nowak worried and continued: “Often stories are only briefly read and then shared immediately. False messages or simply old stories keep spreading like this.” Of course, Markus Hengstschläger wanted to know what can be done about that. “Aligning your message consumption to established ‘media brands’ helps guide the individual”, was Nowak’s response. You just can not consider every news source as reputable. In general, however, qualitative journalism faces a major problem, as income is breaking away. 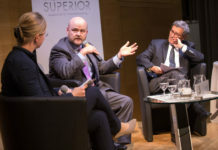 “If there is no countermeasure, then there will be no good journalists in 10 to 20 years”, Nowak predicted, “but then nobody should be surprised, because that was predictable.” There will certainly be new technologies in the future, new channels to report on. Journalism will remain journalism. However, individual journalists will have to master more and more fields in the future: “Today you have to write for print, think online, make videos, use social media – that will become even more in the future”, said the editor-in-chief.